Additional injuries are a risk associated with any kind of surgery or medical procedure. However, when products are released that carry a significantly higher risk of such injuries, manufacturers should be held accountable for any harm that results. Physiomesh, or Johnson & Johnson Ethicon Mesh, was introduced into commerce as a safer alternative to traditional hernia mesh to repair a patient’s hernia and prevent a recurrence. However, some studies have suggested that there is actually a higher rate of recurrence when Physiomesh is used, rather than similar products. The Boston hernia mesh lawyers at the Naumes Law Group are ready to assist victims who have suffered significant side effects resulting from Physiomesh with filing claims against responsible manufacturers. Our product liability attorneys provide personalized and dedicated representation throughout the entire duration of litigation to ensure that each client’s goals and interests are served. Physiomesh is a type of hernia mesh that is used to repair a ventral hernia, which occurs at the site of a past surgical incision when weak muscle or tissue allows an internal organ to pass through. 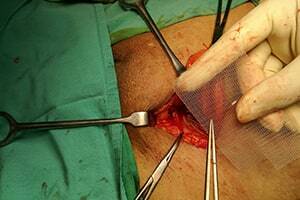 Physiomesh is used in a patch to strengthen the weak muscle or tissue and prevent the hernia from re-opening. Unlike other hernia mesh, Physiomesh is made up of flexible, non-absorbable plastic strands that are woven into a fabric and placed between layers of Monocryl, which is intended to act as an anti-inflammatory agent. The Food and Drug Administration (FDA) approved Physiomesh for the market beginning in 2010, without the usual clinical trials required of other new medical devices, since it was described as similar to those already used in commerce. In May 2016, Johnson & Johnson voluntarily withdrew Ethicon Physiomesh from the market after two studies reported a higher rate of recurrence and need for additional surgery when compared to other similar products used for hernia repair. The unique coating intended to prevent inflammation and the related adhesion complications has been described as biologically incompatible with patients, leading to severe side effects. Complications reported as a result of Physiomesh implants include infections, chronic and severe pain, recurrences, adhesion, mesh migration, and intestinal blockage. Often, patients who suffer these types of complications require additional surgery to repair the hernia by using an alternative method. Our hernia mesh attorneys can help Boston residents and others explore their legal options when they are dealing with this situation. When manufacturers release products into the market, consumers expect that they have undergone the proper testing to ensure their safety. That expectation is often even higher when it comes to surgical devices and other medical products that are meant to be used for the treatment of an existing injury. If a product is unreasonably dangerous and results in additional harm to patients, its manufacturer should be held responsible. Manufacturers have a duty to provide reasonably safe products, and when that duty is breached by a design or manufacturing defect, a manufacturer is strictly liable for the harm that results. Design defects are present when a product’s design contains a flaw that makes it unsafe for its intended use. Cases against the Physiomesh manufacturer, Ethicon, Inc., allege that the two layers of Monocryl that provide a coating do not adequately allow the mesh to incorporate itself into a patient’s body, and therefore, they trigger a chronic foreign body response, leading to an intense inflammation that requires revision surgery. If you or a loved one has sustained an additional injury after being implanted with Physiomesh, it is important to consult a seasoned injury attorney who can help you determine an appropriate course of action. The Boston hernia mesh attorneys at the Naumes Law Group can help ensure that irresponsible manufacturers aid in easing the financial burden of victims harmed by their products. Our firm offers dedicated representation to residents of Springfield, Worcester, Waltham, Watertown, Hyannis, Malden, Medford, Taunton, Peabody, Braintree, Weymouth, Quincy, Pittsfield, and Plymouth, as well as other communities in Suffolk, Middlesex, Barnstable, Berkshire, Bristol, Essex, Franklin, Hampden, Hampshire, Norfolk, Plymouth, and Worcester Counties. Contact our office today at 844-826-8445 or 618-227-8444, or contact us online, for a free appointment to discuss your legal options.